Music solves everything, even a monster slime infestation! DJ Mark and Nerdy Billy had been friends for years. But this friendship was strained when Billy was not invited to a big uptown teenage party where Mark was hired to work as a disc jockey. Being an inventor and somewhat crazy scientist, Billy discovered a way to ruin the party for everyone by creating monster slimes that would scare all the party-goers away. But soon after launching his master plan, Billy had a change of hearts, and he asked DJ Mark to help him fix things before the party starts. Billy gave Mark a powerful weapon against the slimes: A music box that can deliver a sonic explosion that exterminates slimes on contact! But the sonic blast is so strong that it can also knock out Mark himself! So now it's up to DJ Mark to carefully take care of this slime infestation! Don't let the slimes touch DJ Mark, or his happy tune will end abruptly! 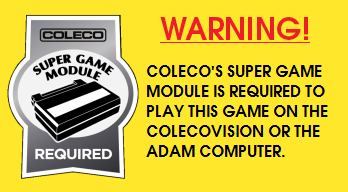 To thank Armando for his help, I offered him to publish any ColecoVision game he wanted. The choice of game was entirely up to him, and he eventually teamed up with Nene Franz (the guy behind Zombie Incident) to recreate Booming Boy, a game Armando had released on the MSX2 a few years ago. 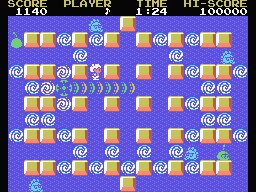 The MSX2 computer has more advanced graphic and sound capabilities, so the ColecoVision version obviously required a downgrade in graphics and sound output, but the game plays the same, which is the important thing. 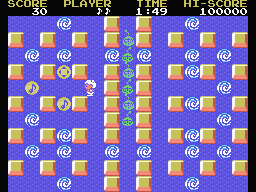 Programming of this game was performed by Armando Pérez Abad and Nene Franz. Software Cartridges will be assembled soon. Box Boxes have been printed. Manual Manuals have been printed. Cartridge Casing The game will be offered in standard Coleco cartridge casings. Cartridge Label Labels have been printed. 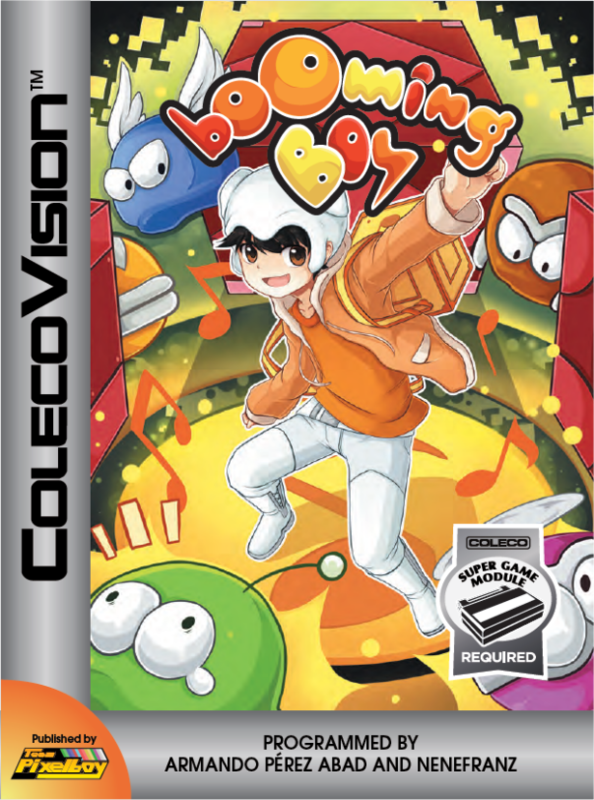 Here is a YouTube video of the ColecoVision version of Booming Boy. Booming Boy - © 2017 Armando Pérez Abad and Nene Franz.